For background data on the riding demographic, economic, social and political characteristics, see: February By-elections: Matching Census Data with Ethnic Media Coverage (1-18 January 2019). 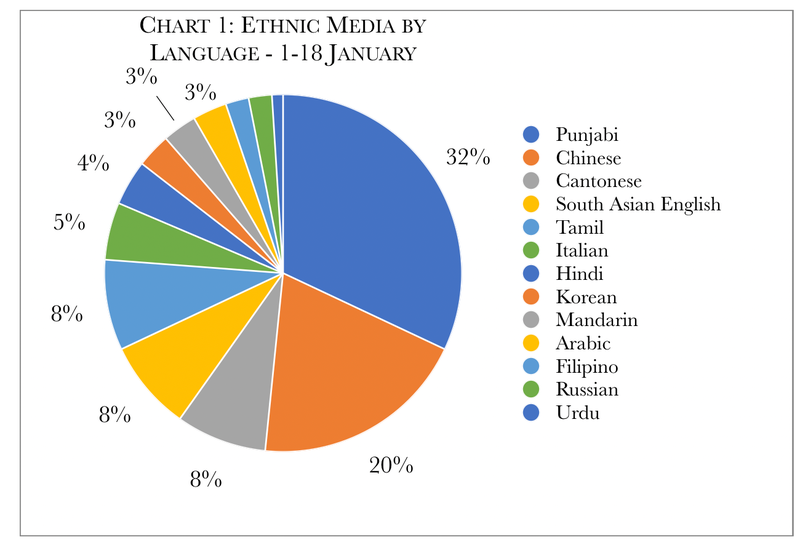 Note: While Chinese in the chart of ethnic media coverage refers to written media, Cantonese and Mandarin to broadcast oral media, I generally summarize all three as Chinese media except where indicated. As expected, by-election day generated the most articles since the by-election call, with a mix of pre-result (32) and post-result result (57) articles. Most articles continued to focus on Burnaby South given NDP leader Singh’s successful campaign. The chart below shows the by-election coverage by language from the start of the year (321 articles), along with the breakdown from last week. During the past week, while pre-result coverage was Punjabi (43.8 percent) and Chinese (34.4 percent, almost half of the result coverage was Chinese (48.3 percent) with Punjabi at 29.2 percent. The results were also covered by more language groups, a similar pattern to that of by-election call coverage. Pre-by-election coverage was a mix of factual stories regarding the three by-elections and articles highlighting the stakes for NDP leader Singh, particularly in Punjabi media. Other articles of note included articles on PPC leader Bernier’s visit to Burnaby South and PPC candidate Tyler Thompson (Punjabi), Chinese Canadian support for the PPC (based on the Star article How Canadian populism is playing out in the Burnaby South by-election), Conservative candidate Shin’s opposition to edible cannabis (Chinese), and NDP candidate in Outremont Sanchez’s comments on what people are talking about, the most interesting being comments regarding NDP leader Singh’s turban (Filipino). Commentary was largely analysis of the prospects of NDP Singh in Burnaby South and the NDP more generally, with the general tone being somewhat pessimistic while noting the SNC Lavalin scandal may increase his prospects. Post-results commentary focussed on the immediate impact for the NDP of leader Singh’s victory as well as some broader opinions and analysis on what the results may mean for the October general election. One commentary in Punjabi media noted that Singh’s victory showed he could take on “tough challenges.” Another in Chinese media considered that the Liberals should be considered the “biggest winner” as they appear to have been unaffected by the SNC Lavalin scandal in Quebec while another, also in Chinese media, quoted UBC professor Allan Tupper’s comments that not too much should be read into these results with respect to the general election, a point also covered in Hindi media. While the strong results of the PPC in Burnaby South were not subject to analysis or commentary in Punjabi media, they did provoke a number of commentaries in Chinese media. One explained Chinese Canadian support as reflecting “church influence, different values of their native country and Canada, and their dissatisfaction with Trudeau” as the main reasons for the Chinese Canadian community to turn to the right (note: Chinese Canadians tend to support Conservatives more than other parties). Another stressed their social conservatism as a reason and a third the PPC’s highlighting the murder of Marissa Shen, allegedly by a Syrian refugee. See the MIREMS blog for some of the stories being covered: MIREMS blog. Of all the results of Monday’s by-elections, I found this to be the most interesting, given the role that Chinese Canadians appear to have played in the strong PPC result of 11 percent (39 percent of Burnaby South are Chinese origin). The fledgling People’s Party of Canada got off to an uneven start in its first electoral test Monday in a trio of federal byelections. The party, founded last fall by former Conservative leadership contender Maxime Bernier, captured some 11 per cent of the vote in the Vancouver-area riding of Burnaby South but failed to make much of a splash among voters in the rural Ontario riding of York—Simcoe or the urban Montreal-area riding of Outremont where the party had less than 2 per cent of the final tally. Laura-Lynn Tyler Thompson, a former Christian talk show host who had some name recognition before launching her candidacy, was tapped by Bernier to represent the People’s Party in Burnaby South. She delivered the best result of the night for the new political outfit. While she was a source of controversy because of some past remarks, Thompson peeled away enough votes from the more established parties to place fourth overall. Thompson, whose slogan was of “Canada for Canadians,” ran a decidedly populist campaign for Parliament. Thompson has said her base was heavily comprised of evangelical Chinese-Canadian churchgoers in the diverse B.C. riding. The comparatively strong showing by Thompson — in a riding ultimately won by NDP Leader Jagmeet Singh — appeared to cut in to the Conservative party’s results in that riding. Conservative Burnaby candidate, Jay Shin, captured about 23 per cent of the vote — five points less than what the previous Conservative candidate there managed to achieve in the 2015 federal election. Shin placed third behind Singh and Liberal candidate Richard T. Lee. In central Canada, meanwhile, the People’s Party proved to be a marginal political force. For example, in York—Simcoe, Ont., People’s Party candidate Robert Geurts, a criminal defence lawyer, placed a distant sixth out of nine candidates. Geurts, best known for his past role as a prosecutor during the Paul Bernardo trial, was even outpaced by Dorian Baxter a candidate for the minor centre-right PC Party, an entity with a name similar to the now-defunct Progressive Conservative Party of Canada. Scot Davidson ultimately held the rural seat for the Conservative party with a 20-point margin over Liberal Shaun Tanaka. Fewer than 20 per cent of registered voters in York—Simcoe bothered to vote in Monday’s contest. Even before the results were finalized, Bernier tweeted Monday that volunteers should be proud of what they accomplished so soon after the party was founded. “The hundreds of volunteers who helped our candidates in Burnaby South, York–Simcoe and Outremont can be proud of what they achieved. They blazed a trail that thousands of others will follow across the country in October,” he said. In Outremont, People’s Party candidate James Seale, a Canadian Army veteran, also failed to post a result better than 2 per cent of the vote. Seale was a member of the armed forces for more than 30 years, and served overseas stints in Israel, Germany, Haiti and Bosnia before later becoming a military instructor and civil servant. He said he was attracted to the party because of Bernier’s promise to increase investment in Canada’s defence. While Bernier’s party disappointed in the Quebec riding, Green party candidate Daniel Green placed third — among the party’s best ever showing in la belle province. Green, the deputy leader of the Green Party of Canada, posted better numbers than Bloc Québécois candidate Michel Duchesne and Conservative candidate Jasmine Louras who placed fourth and fifth respectively in the riding that was last held by former NDP leader Tom Mulcair. “The GPC has always been underestimated. But just watch us in October,” Green tweeted Monday in reference to the forthcoming federal election. While Mulcair won the riding by more than 11 points in the 2015 federal election, Liberal Rachel Bendayan easily captured the seat Monday outpacing NDP candidate Julia Sánchez by more than 15 points. Good coverage on the emerging role and tactics of the PPC along with Ekos pollster Frank Graves’ analysis of greater polarization among Canadians. Twenty minutes before the first Burnaby South byelection debate, a sudden influx of People’s Party of Canada supporters with shiny signs and newly minted pins filled all the remaining chairs in the room. And they were ready to be heard, not just seen. The following two debates — attended by roughly 100 people, on average — were dominated by this group’s grievances. They were louder and rowdier and far outnumbered the supporters of any other national party in the House of Commons. The third debate descended into chaos when the topic of immigration arose, leading to finger-pointing and shrieking in the audience. “Canadians first,” yelled several in the crowd, donning PPC pins. Roars from the crowd drowned out the candidates as others shouted “racist” and “fascist” in response. This is one face of an increasingly visible populist movement in Canada. And experts say it’s not going anywhere any time soon. More and more, there is less common ground in what we consider to be Canadian values, and experts say the nation’s shift toward populism heralds a new chapter in Canada’s life. Political discourse is only expected to become more entrenched and vitriolic ahead of October’s general election. Frank Graves is the president of Ottawa-based EKOS Research Associates. He’s been tracking what he calls “ordered populism” or what economists refer to as drawbridge-up thinking. While populism can operate either on the left, right or even centre of the political spectrum, Graves said that is not what is emerging in Canada. Instead, it’s ordered populism which is bubbling up in the values of the right and far-right. Its members are largely religious, have reservations about diversity, are deeply pessimistic about their economic future, are disdainful of media and government and are convinced that climate change matters far less than their own survival. “What unifies populism is a dispute between the so-called pure people and the corrupt elite. And that is definitely what Trump, Brexit, Ford and the PPC is going after,” he told Star Vancouver. Maxime Bernier, the leader of the PPC, is speaking a “far more authentic” version of what those in the ordered populist camp want to hear, Graves added. After a messy split with the Conservative Party last year following his loss in the leadership race, Bernier — an MP from Beauce, Que. and a former cabinet minister in the Stephen Harper era — announced the launch of the People’s Party of Canada, made official with Elections Canada this January. He’s since been touring the country. Burnaby South’s Laura-Lynn Tyler Thompson — a former Christian radio host, anti-abortion activist and vocal opponent to British Columbia’s student education plan on sexual orientation and gender fluidity — was one of his first picks to run as a candidate. Her support could be an early indicator of the PPC’s chances in the upcoming general election. Tyler Thompson will face off against federal NDP leader Jagmeet Singh — vying for his first seat in the House of Commons — Liberal Richard Lee, Conservative Jay Shin and independents Valentine Wu and Terry Grimwood on Monday in Burnaby South. Byelections will also be held that day in York—Simcoe, Ont., a seat previously held by former Conservative cabinet minister Peter Van Loan, and in Outremont, Que. The latter riding was home to former NDP leader Thomas Mulcair. Each time Tyler Thompson said “Canadians first,” — which occurred multiple times at every debate — the crowd would swell into visceral cheers. Thompson directly appealed to prevalent anxieties in the riding about public safety as she repeatedly brought up the case of Marissa Shen, a 13-year-old Burnaby South girl who was murdered in the region. A Syrian refugee, who was employed in Canada and had family here, is the accused. Allegations are still being tested in court. Despite common assumptions that the populist movement camp is dominated by disaffected white males, Thompson’s supporters in Burnaby South are composed of a majority of Chinese-Canadians. She told the Star that’s because of her strong roots in some of the community’s churches. People are finding less and less common ground when it comes to Canadian values — and that is certainly going to matter in the upcoming election, Graves said. While politics are often fickle and ever-changing, values change at a glacially slow pace. For instance, at the turn of the century Canadians were more “open” when it came to ideological orientation — which Graves said is a terrific predictor of values — 50 per cent of Canadians agreed that they were neither to the right or the left. But now, Graves said that number has dwindled down to 10 per cent. Values exist in the cultural realm and provide “moral goalposts” on what people prefer society to look like. Unlike discussions of policy issues, debates on values are emotionally engaging which is why Graves estimates the “narrative” of the right is beginning to dominate. And on the left, the opposite end of the ideological spectrum, there has yet to emerge a populist movement with an equally emotive narrative. While the right begins to have its own conversations about values, Graves said the “open values” of the centre and left remain consistent between Liberals, NDP, and Greens. Members of this “open society” outlook favour diversity, immigration, trade and globalization, are optimistic about the future, guided by evidence-based policy and believe that climate change is of high priority. And the gaps between the two groups could not be larger, Graves said. The ongoing focus on Burnaby South continued, in particular given the visit of PM Trudeau to the riding to support Liberal candidate Richard Lee. Overall, coverage remained stable at 26 articles, compared to 25 articles the previous week . 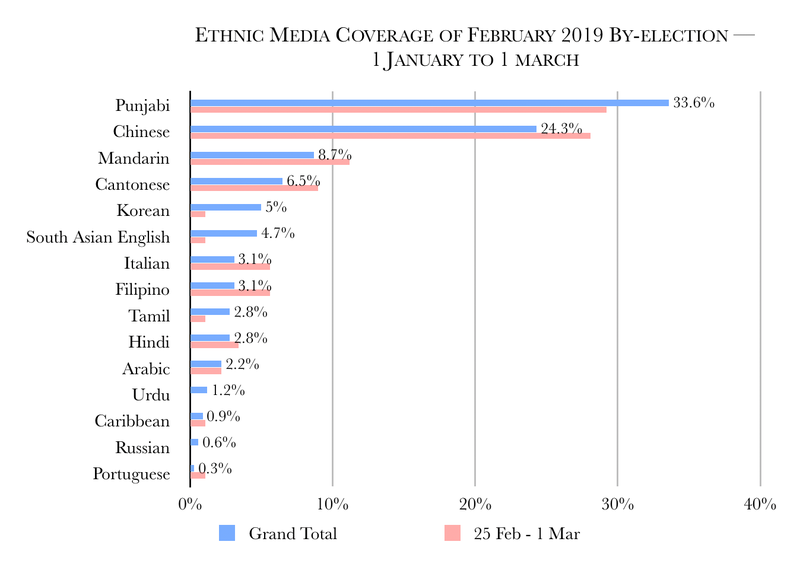 While Punjabi ((30.8 percent) and Chinese (38.5 percent) comprised the majority of ethnic media coverage of the by-elections, this was less than previous weeks. New to ethnic media coverage were two stories covered in Caribbean (English) media. The Prime Minister’s visit featured was covered by all ethnic media covered during this period and was the focus of virtually all the articles in Chinese media. There was some mention of the ongoing scandal regarding possible interference in the judicial process involving SNC Lavalin and former justice minister Wilson-Raybould. Calls by Conservative leader Andrew Scheer and NDP Jagmeet Singh for the PM to waive solicitor-client privilege were reported in Punjabi and Caribbean media. NDP leader Singh appeared to have more success getting his messages out regarding housing and pharmacare than previous weeks, particularly in the Punjabi media, with only one article reporting on the criticism over the NDP opposing recognition of Juan Gerardo Guaidó as acting Venezuelan president. In Korean media, there were reports on a campaign event for Conservative candidate Jay Shin attended by Richmond MP Alice Wong as well as a visit by NDP candidate Singh to Northroad Korean town. In Urdu media, there was a report on Conservative criticism of the impact of the mortgage stress test on housing affordability. In Caribbean media, there was coverage of Outremont, largely a profile of Liberal candidate Rachel Bendayan. Only two commentaries this week. One article in Punjabi media picked up on the arguments by Macleans writer David Moscrop (What if Jagmeet Singh really did have a $5.5 million mansion? Should we care?) without stating their own position. The other article in Chinese media focussing on Burnaby South provoked a range of comments regarding the prospects of the Liberals in the by-election and the upcoming general election. Most of the general election coverage continued to focus on the government’s announced measures to reduce foreign interference in the federal election as well as the CBC analysis of the impact of Twitter trolls on political debates in Canada (Twitter trolls stoked debates about immigrants and pipelines in Canada, data show) and the Nanos survey showing that 60 percent of Canadians believe Facebook will have a negative impact on the election (More than six in 10 Canadians say Facebook will have a negative impact on fall election: survey). Chinese media has also been covering extensively, as one would expect, the ongoing developments of the US extradition request of Huawei executive Meng Wanzhou, speculation regarding possible additional Chinese retaliation and former Ontario Liberal cabinet minister Michael Chan’s concerns regarding anti-Chinese sentiment of the Conservatives and populists. While I am not sure regarding the soundness of Research Co’s methodology and how it formulates questions, the overall gender, regional, party affiliation and age differences broadly reflect other public opinion research. Over the past couple of years, concerns about racism have entered the realm of international politics. We have witnessed some electoral success by xenophobic parties in Europe, as well as the dreadful statements of a Republican presidential contender in the United States who is now the country’s head of state. Just last weekend, Virginia Governor Ralph Northam got in trouble over a photograph allegedly taken when he was attending medical school, at a time when he was not young enough to rely on the “boys will be boys” defence. Several professional football players have protested police brutality and racial profiling in the United States. In spite of what is happening down south and on the other side of the Atlantic, Canadians are not immune to racism. Individuals and organized groups have taken advantage of the anonymity of social media to push a remarkably divisive agenda. Some politicians have attempted to ignore the controversy. Quebec Premier François Legault recently made an ill-timed remark – on the second anniversary of a shooting inside a mosque that left six men dead – claiming that Islamophobia does not exist in his province. In Ontario, just how and when to resort to the acrimonious practice of “carding” – the stopping and documenting of individuals by police even though no particular crime is being investigated – is still a matter of debate. In Western Canada, British Columbia’s provincial government is preparing to re-establish a human rights commission. On the Prairies, provincial administrations have been severely criticized for not doing enough to help First Nations. In Manitoba alone, 11 of the 19 people who have lost their lives in police incidents this century have been identified as Aboriginal. When Research Co. asked Canadians about racism in the country last month, the results were not uplifting. Two in five respondents to the survey (41%) think racism has become a more significant problem in Canada over the past two years. Women (47%) and Canadians aged 18 to 34 (46%) are more likely to feel this way. Quebecers appear to be in tune with their current head of government, with 55% of the province’s residents asserting that racism has not worsened. Conversely, there is one area of Canada where residents are convinced that racism is growing. In Manitoba and Saskatchewan, a whopping 55% of residents think racism has become a more significant problem recently. No other region of the country surpasses the 50% mark on this question. That a sizable number of Canadians are concerned about racism should lead to a debate over the success of government policies. When Canadians were given a choice, just over two in five residents (42%) endorsed the multicultural concept of the “mosaic” and think cultural differences within Canadian society are valuable and should be preserved. A larger proportion of Canadians (49%) express a preference for the concept of the “melting pot” and want immigrants to assimilate and blend into Canadian society. While women are equally divided in their assessment of the two concepts, most men (53%) favoured the “melting pot.” And while a majority of those aged 18 to 34 (60%) are fond of the “mosaic,” support for this idea falls to 39% among those aged 35 to 54 and 27% among those aged 55 and over. In an election year, it is important to analyze these findings by political allegiance. The voters who supported the Liberal Party or the New Democratic Party (NDP) in the last federal ballot hold similar views on two issues: multiculturalism has been good for the country and the “mosaic” is preferable to the “melting pot.” However, NDP voters are more likely to think racism has become a bigger problem recently (55%) than Liberal voters (40%). In stark contrast, Canadians who voted for the Conservative Party in the 2015 federal election are unequivocally more likely to say that multiculturalism, as a policy, has been bad for Canada (42%), to express that racism has not become a significant problem in the country (56%) and to choose the “melting pot” (62%). Centre-right parties have never wholly embraced multiculturalism, which is often regarded as a legacy of the Pierre Trudeau era. They are not expected to do so now. The survey suggests that while Canadians may not love everything about multiculturalism, they are signalling that they can be trusted to handle newcomers in a “melting pot” scenario better than the Americans. In any case, the fact that two in five residents feel that racism is intensifying should be disturbing for policy-makers. Filed under Multiculturalism Tagged with ethnic vote, Mario Canseco, Research Co. I would be cautious in drawing parallels between municipal and federal/provincial elections. The former tend to under-represent visible minorities and other minority groups whereas federal and political parties tend to recruit candidates from the larger visible minority or ethnic groups, as well as developing policies to attract minority voters (e.g., the Conservatives Chinese head tax historical recognition program when they first formed the government). And nobody I know is suggesting that groups vote as a block. However, exit polls do suggest that groups have overall political leanings (e.g., Chinese Canadians lean conservative, Canadian Sikhs Liberal or NDP). So the reality is more complex than presented here. Byelection campaigns can be extremely complex events. Voter turnout tends to be lower than in a regular electoral contest, when all the seats in a particular legislative body are at stake. Potential voters are often disengaged and disenchanted, and the lack of deep media coverage leads to citizens not even knowing that they have a chance to exercise their franchise. In the case of the federal vote that will take place on February 25 in British Columbia’s Burnaby South constituency, the presence of the leader of the federal New Democratic Party (NDP) in the ballot has certainly added some interest. Jagmeet Singh seeks to be the first leader of the main three Canadian federal parties to represent a B.C. riding since Stockwell Day headed the Canadian Alliance. The Burnaby South byelection was supposed to be an early test of strength for the NDP leader, as well as an indicator of whether the newly created People’s Party would eat into some traditional support for the federal Conservatives. The race took a wild swing earlier this month, after a poorly worded statement from Liberal candidate Karen Wang was posted to social media platform WeChat and uncovered by the staff at Star Vancouver. In a span of 32 hours, Wang resigned, asked to be reinstated and flirted with a run as an independent. The Liberals have now named former provincial lawmaker Richard T. Lee as their standard bearer. Wang’s demotion by the Liberal Party has precipitated a much-needed debate on the way political campaigns in Canada operate when it comes to courting so-called “multicultural” voters. Political consultants charge fortunes pretending to create a magic potion to engage with particular ethnic communities, and messages are crafted to make candidates appear more in touch with voters who immigrated to Canada. This can backfire quickly, as demonstrated in British Columbia by the 2013 “quick wins” scandal. In elections of all types – municipal, provincial and federal – there is a tendency to make assumptions based on the demographic characteristics of a particular population. These assumptions are usually incorrect. Just last year, we were treated to illusory media commentary that suggested that being married to a Filipino woman would propel a Vancouver mayoral candidate to victory. The candidate finished in fifth place, as the supposed Filipino constituency that seemed discernible looking at census data never materialized. In first-past-the-post elections, the futility of this misleading analysis becomes evident. There is more to a community than the origin of its residents. In Richmond, where 53 per cent of residents are of Chinese descent, three Chinese-Canadian candidates garnered 4,794 votes together. Incumbent Mayor Malcolm Brodie was re-elected with 30,452 votes. The ability of an electoral contender to connect with voters of a particular ethnicity cannot measured by a last name, origin or ability to feature foreign languages in campaign paraphernalia. 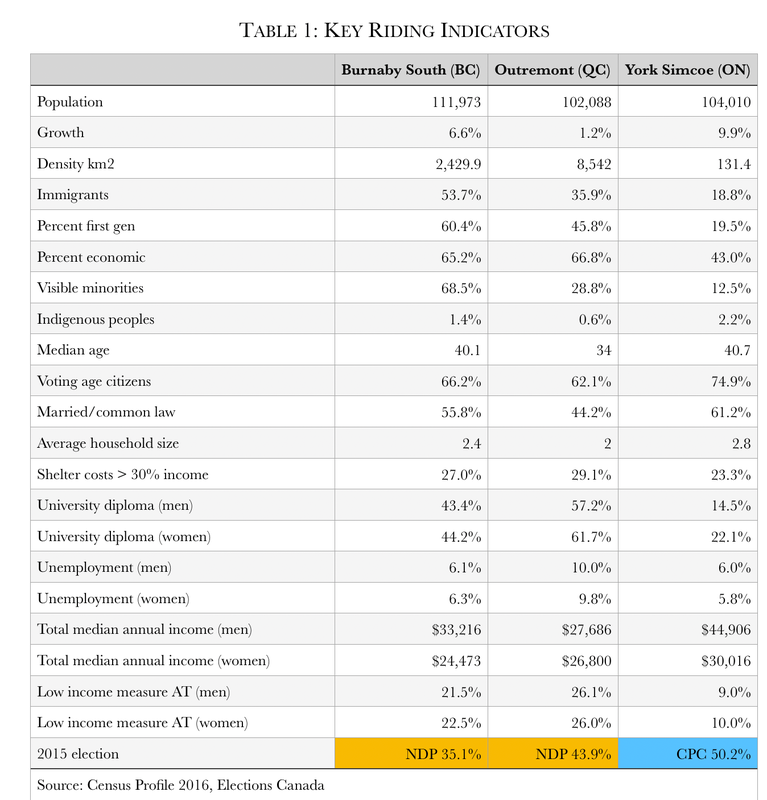 A survey I conducted a few weeks before the 2015 federal election showed that voters in Metro Vancouver of East Asian, South Asian and Southeast Asian descent placed “the candidate’s ethnicity” as the least important motivator for their vote. These “multicultural” voters were moved primarily by two issues: the candidate’s position on issues and the political party they represented. Contrary to what data-less pundits believe, voters of a particular ethnicity do not cast their ballots as a block. In addition, the efforts of politicians to appear inclusive and mindful do not always move the needle. Last year, 69 per cent of British Columbians said that politicians who show up at ethnic festivals and celebrations are merely pandering for votes and are not truly interested in engaging with people from different backgrounds and cultures. The proportion of voters who are not amused by public servants suddenly showing interest in ethnic celebrations included 76 per cent of residents of South Asian descent, 70 per cent of Europeans and 62 per cent of East Asians – something to ponder the next time politicians don traditional garb for Vaisakhi. Regardless of the result in Burnaby South, a conversation about treating “multicultural” voters as a commodity has started. It will be interesting to see if political parties learn from Wang’s demise and work harder on policy development and meaningful community outreach, instead of trying to score points with their last names or birthplaces. The political climate of the country has evolved to a point where candidates do not need to advertise themselves as “the only [insert ethnicity here] in the race.” Let’s hope that situations like the one that led the Liberals to replace their Burnaby South byelection candidate are the exception – and not the norm – in the next federal campaign. As some of you may be aware, I have been working through census data to develop profiles of all 338 federal ridings that focus on key demographic, economic, social and political indicators. I have been working with Canada’s multilingual media monitoring service, MIREMS (www.mirems.com) to test out matching their ethnic media coverage with the census data. The current by-elections provide an ideal opportunity to test out this approach and to assess how useful this could be for this year’s October 19th general election. Table 1 contrasts some of the key indicators for the three ridings, two urban and one rural. Burnaby South has the greatest number of immigrants and visible minorities, York Simcoe the least, with Outremont in the middle. None of these ridings have a significant Indigenous population. Outremont has the youngest population with the least number of married or common law relationships and the lowest average household size. York Simcoe, given its lower number of immigrants, has the highest number of citizens of voting age. Outremont has the highest number of men and women with university degrees, York Simcoe the lowest. Unemployment rates for men and women are highest in Outremont. Median total annual income is highest for men in York Simcoe and lowest in Outremont; for women, it is also highest in York Simcoe but lowest in Burnaby South. The percentage of low income individuals (Low income measure after tax) is lowest in York Simcoe and highest in Outremont for both men and women. Burnaby South and Outremont elected NDP MPs in 2015, York Simcoe a Conservative. The detailed riding profiles are here: 59003 – Burnaby South, 24054 – Outremont, and 35119 – York Simcoe. The language most often spoken at home, the indicator that correlates most closely with ethnic media readership, is captured in Table 2. 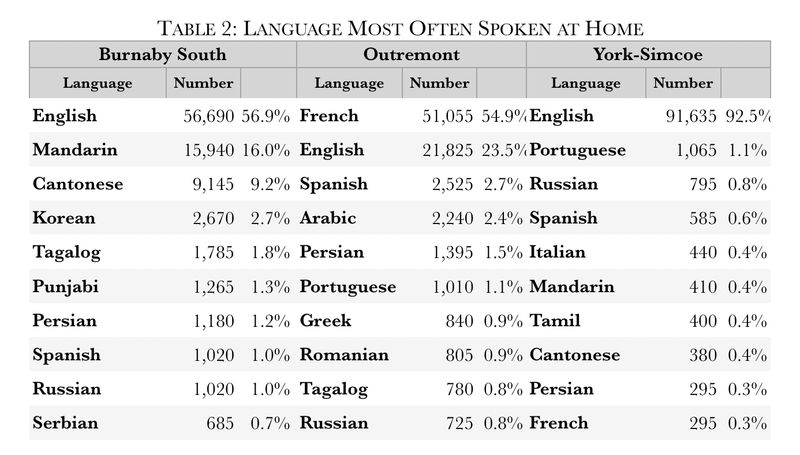 Predominate non-official languages are Mandarin and Cantonese (about 25 percent) whereas Outremont and York Simcoe have few non-official languages most often spoken at home. As one would expect, Chinese and South Asian media dominate in the by-election coverage given riding demographics, mainly Chinese Canadians, and the highly visible candidacy of NDP leader Jagmeet Singh. The ill-advised remarks of former Liberal candidate Karen Wang, her forced resignation and replacement by Richard Lee have further increased the riding visibility. 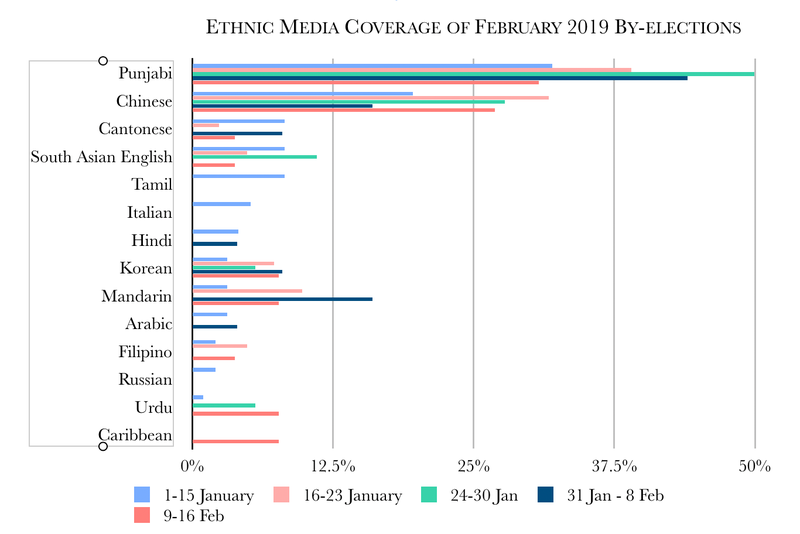 As a result, of the 97 media articles monitored 1 to 18 January, one third of ethnic media coverage is in Punjabi, with an additional 8 percent in the South Asian English media. Written Chinese media forms one fifth, with radio and TV in Cantonese forming 8 percent and in Mandarin, three percent. In terms of candidate specific coverage, NDP leader Singh was covered in about two-thirds of the media, with many articles focussed almost exclusively on his campaign and related challenges (e.g., his inability to answer questions regarding the detention of Canadians in China). His Liberal and Conservative opponents were only mentioned in about 15 percent of media, with of course the controversy over former Liberal candidate Wang’s divisive remarks being mentioned. PPC candidate Tyler Thompson was mentioned by close to six percent. There was only one article (reprint really of her website bio) focussed on Outremont, a profile of Liberal candidate Rachel Bendayan in Arabic, with no coverage of the Conservative and NDP candidates (Jasmine Louras and Julia Sanchez respectively). Outremont has a significant Jewish population (11 percent in 2011). Bendayan is Jewish (likely Sephardic given her surname) as appears is Louras. Overall voting preferences of Canadian Jews have shifted from Liberal to Conservative reflecting the previous government’s focus on combatting antisemitism and a more overt pro-Israel policy. Basic news reporting and reprinting of mainstream media news article form the majority of ethnic media articles. However, close to 40 percent of the Punjabi and South Asian English, and about 13 percent of the Tamil media media are commentary. Only Punjabi talk shows featured by-election coverage (Burnaby South). Out of the 16 commentaries analyzed, 12 were in Punjabi, three in South Asian English and one in the Tamil media. For the most part, these were more in the form of neutral analysis than presenting opinions. Only three commentaries expressed opinions. All were negative, two were in the Punjabi media (NDP leader Singh’s ignorance of China’s arrest of Canadians in relation for the extradition case of Huawei executive Meng Wanzhou, former Liberal candidate Wang’s divisive ethnic appeal on social media) and one in the South Asian English media (the same critique of NDP leader Singh). Next week will likely feature more commentary on ethnic politics given the debate is has provoked among many Canadians, including those in the language groups covered. See the MIREMS blog for some of the stories being covered: Karen Wang and the ethnic vote: Multilingual media weighs in. In related election coverage, the Supreme Court of Canada’s striking down the five-year limit for Canadian expatriate voting received coverage, particularly in Cantonese, Chinese and Mandarin media but also with significant coverage in Tamil media. The Shri Guru Ravidass Sabha gurdwara in Burnaby was packed recently for a speech by Jagmeet Singh, the federal New Democratic Party leader. About 800 people squeezed into the Sikh temple, in the heart of the ethnically super-diverse riding of Burnaby South, where Singh is fighting for the first time win a seat as a federal MP. The Punjabi-language Sach Di Awaaz newspaper ran 12 photos of the event featuring the Ontario-based politician. Ethnicity has already been highlighted as a factor in the crucial Burnaby South byelection. A member of the Burnaby gurdwara holds a copy of the free bi-weekly Sach Di Awaaz newspaper that shows NDP candidate Jagmeet Singh at to speak to hundreds of people. This week, media reported on the way Liberal candidate Karen Wang said in a WeChat post that, as the only Chinese candidate, she could beat Singh, who she noted is of “Indian descent.” Wang said the post was written by a campaign volunteer, but she took responsibility for it and apologized to Singh. Under pressure from the Liberals for her remark, Wang dropped out of the race, although she hinted Thursday there is a slim chance she’ll run as an independent. Burnaby is known as one the most diverse cities in Canada, if not the world. An earlier Vancouver Sun study found there’s a 73 per cent chance that two randomly chosen people from Burnaby will be of a different ethnicities. For comparison, the chance is just 34 per cent in Ottawa. The riding of South Burnaby is almost 40 per cent ethnic Chinese, 30 per cent white, eight per cent South Asian (a category that includes most Sikhs), six per cent Filipino and three per cent Korean. Given the riding’s eclectic ethnic makeup, the proportion of South Asians and Sikhs within it is not nearly as large as it is in other pockets. The modest Shri Guru Ravidass Sabha gurdwara is the only Sikh temple in South Burnaby, whereas there are many gurdwaras serving the large Sikh populations concentrated in places such as Surrey and the western suburbs of Toronto. The successful campaign of Singh, a turban-wearing orthodox Sikh, for the 2017 NDP leadership relied significantly on him visiting gurdwaras and drumming up support from Sikhs, who almost all have roots in the Punjab region of India. Such South Asians were tremendous financial supporters of Singh during the leadership race, which he surprisingly won with 54 per cent of the vote on the first ballot. Elections Canada data shows Singh collected $603,000 in the year of the NDP leadership convention. More than nine out of 10 of his donors in that year had South Asian names, specifically Punjabi and Sikh (Sikhs often include “Singh” or “Kaur” as one of their names). Donors to Singh’s leadership campaign — which boasted about signing up a dramatically high number of new NDP members — hailed heavily from the western Toronto suburbs of Brampton and Mississauga, and from Surrey. More than a third of Singh’s 2017 campaign funding came from those three municipalities alone. The federal Liberals have also long been aware of the political power linked to the related issues of ethnicity and immigration status. They could be major factors in the riding of South Burnaby, since six in 10 residents of the riding are either immigrants or non-permanent residents. That’s triple the national average of two out of 10. The Trudeau Liberals frequently highlight how they are increasing Canada’s annual immigration levels to 340,000, from 250,000 in 2015 under the Conservatives. And Immigration Minister Ahmed Hussen has recently been goading the Conservatives on Twitter for not being as supportive of family-reunification programs, which are especially important to many extended South Asian families. At the gurdwara in South Burnaby this week, some visitors supported the Liberals’ moves to increase the number of sponsored spouses, parents, and grandparents permitted into Canada under the family-reunification program. People interviewed at the gurdwara, who did not want their names used, said they had relatives in the Punjab they would like to bring to Canada. How much is ethnicity, culture, immigration status and religion a factor in Canadian politics? Some people on social media found it controversial in 2018 that Caucasian candidates for city councils in Metro Vancouver appeared to be relatively more successful than candidates from other ethnic groups, leading to the derogatory Twitter hashtag #councilsowhite. Data have not been made publicly available in Canada, however, on the extent that people of any particular ethno-cultural group vote for candidates of their own ethnicity. Privately, though, Canadian political party strategists often target voters based on which group they belong to. The federal Conservatives, for instance, have over the years won many votes from evangelical Christians. But since the NDP candidate for Burnaby South won the riding in 2015 with only 500 more votes than the Liberal candidate, Singh will need to work hard to appeal to voters outside his own ethno-cultural-religious group if he is to hold onto the seat for the party he now leads. Abdikheir Ahmed vividly remembers casting his ballot for the first time in Winnipeg’s 2010 municipal election. Not only was he excited, he had an entourage. The 39-year-old Winnipeg resident arrived in Canada from Somalia as a refugee in 2003. It took several years before he could legally vote as a Canadian citizen, but he was eager to do so. “I feel that I have a responsibility to decide the direction that this country goes in,” said Ahmed. Now, he runs Immigration Partnership Winnipeg, an organization that helps immigrants and refugees get settled in that city. Visible minorities make up one-quarter of the population in Winnipeg, according to Statistics Canada, though not all are recent immigrants. It’s become conventional wisdom in Canadian politics that immigrant voters can have a powerful influence in elections. According to Ahmed, immigrants — new or long-settled — are a potentially powerful block of voters. “It actually makes sense to court the so-called immigrant vote because that is the determining factor, and it’s a growing population,” said Ahmed. But as the battle begins for this year’s federal election, experts say no party has a monopoly on any particular ethnic group or religious minority. Canada’s major parties have been competing for immigrant voters since the 1960s, according University of Toronto political science professor Phil Triadafilopoulos. “The main sources of immigration were different then, but the dynamics were very similar. It’s an urban Canadian story,” said Triadafilopoulos. In the 2019 federal election, ridings in Toronto and Vancouver are considered key battlegrounds that can make-or-break a party. Both have high Chinese and South Asian populations. But they aren’t the only cities where politicians are courting ethnic voters. Andrew Griffith, a fellow of the Canadian Global Affairs Institute and the Environics Institute, says data on immigration and ethno-cultural diversity from the 2016 census shows many Canadian communities now have a larger percentage of visible minority residents than in 2011. Of 338 federal ridings in Parliament, 41 have populations where visible minorities form the majority, compared with 33 five years earlier. “Parties, when they’re developing their electoral strategies, take that into account in terms of how they advocate policies and programs to attract them,” said Griffith. What’s more difficult is pinning down whether immigrant voters have partisan preferences. New Canadians could once be counted on to vote Liberal, ever since Pierre Trudeau opened the door to more immigration in the 1970s, but that unwavering endorsement became less pronounced over the past decade. Griffith says recent polling data suggests some ethnic communities still lean toward certain parties. Sikh-Canadians, for example, have a “general tendency” to vote Liberal and NDP, while Conservatives enjoy more support among Chinese-Canadians. In Winnipeg, Ahmed says it shouldn’t even be assumed new immigrants will exercise their franchise. He’s working to mobilize visible minority and newcomers who have earned citizenship to vote in this year’s federal election. “Many newcomers have never voted in their own countries or have engaged in electoral processes that are not transparent, so do not actually trust the process and don’t see the importance of voting in it,” said Ahmed. Immigration Partnership Winnipeg developed posters and videos on how and where to vote that were translated into 12 different languages, and concentrated on ethno-cultural community organizations to get the message out. Ahmed’s impression is that immigrants don’t vote in blocks, but he says ethnic communities will respond electorally if they feel targeted by an issue. For example, when the federal Tories campaigned in 2015 on policies such as banning the niqab at citizenship ceremonies or setting up a “barbaric cultural practices” tip line, Ahmed says it spurred newcomers to vote against them. “The messaging from the Conservative Party came across as anti-immigrant,” said Ahmed. It’s a point echoed by Triadafilopoulos, who suggests large numbers of immigrant voters is one of the reasons Canada has not experienced the same kind of xenophobic populism sweeping Europe and the United States. “The demographic and institutional facts [in Canada] just make it a losing proposition,” he said. …The transformation of Canada is already far advanced, and continuing. By 2036, the agency predicts, as many as 30 per cent of all residents will not have been born in Canada. Another 20 per cent of the population will be native-born, but with at least one immigrant parent. Since the vast majority of immigrants come from Asian or Pacific nations, within 20 years Canada will likely be as brown as it is white. Some old-stock Canadians, as Stephen Harper called them, will resent this. No one asked them, they will say, whether they wanted the European, Christian country they grew up in to be transformed into something so cosmopolitan. They lament the loss of traditional values and social solidarity. Some of them look with envy to the United States, where Donald Trump surfed nativist resentments all the way to the White House. But a Canadian Donald Trump – at least one who wins a general election – is unlikely. There is no future courting the angry white vote. There just aren’t enough angry white voters. Some Conservative leadership candidates are flirting with nativism nonetheless, because the Conservative Party membership is older and whiter than the general population. But, in fact, Conservatives should welcome immigrants. The Philippines, India and China accounted for 40 per cent of new arrivals in 2015. They are economically and socially more conservative than many of the native-born; many of them voted for Mr. Harper in 2011, and they are a natural constituency for the Conservative Party. Justin Trudeau, however, won suburban ridings with large immigrant populations across the country in 2015. Politically, keeping those voters loyal is his first and most important task. Winning them back should be the first and most important task of the next Conservative leader. The massive demographic shifts under way in Canada speak to both growth and decline across the country. In 2036, StatsCan predicts immigrants will make up at most 10 per cent of the population in New Brunswick and Nova Scotia. About a third of Montreal’s population could be immigrant, but in the rest of the province they will be hard to find. In Ontario and British Columbia, about a third of the population will be foreign-born, and Alberta should be near 30 per cent. In terms of both population and politics, Canada will be a country of large, growing, young, diverse cites, with everything in between older and whiter and continuing to decline. Quebec will struggle to make its voice heard: those whose mother tongue is French will decline from 21 per cent of the population today to 18 per cent in 2036. The number speaking English as a native language will also go down, but up to 30 per cent of Canadians will have a mother tongue that is neither English nor French. Canada is losing its old-time religion. Ninety per cent of Canadians identified as Christians in 1970. Today, it’s two-thirds, and will be just over one half by 2036. Christianity is not being displaced by other religions – only 7 per cent, at most, will identify as Muslim by 2036 – but by no religion at all. A quarter of all Canadians today identify with no faith, and that number could reach a third by 2036. The fact that this country has deliberately transformed the makeup of its population in a way no other country has managed, or even attempted, speaks to the tolerant, diverse society in which we live. Multiculturalism works and Canada is proof. If you’re grinding your teeth at this, if you long for the Canada that was, it’s easy to understand your frustration. That Canada has gone away. By 2036 it will be barely a memory.